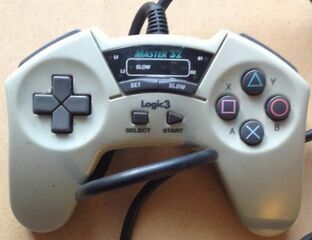 The Master 32 by Logic 3 is a third-party control pad for the Sega Saturn. It is dual-format controller (with support for the Sony PlayStation), and has turbo/programmable features. It builds on a PlayStation controller called the Station Master, similar to how the Explorer 32 (with similar features to this pad) builds on the Explorer SS.